The old Packard, where it sat for more than 40 years. 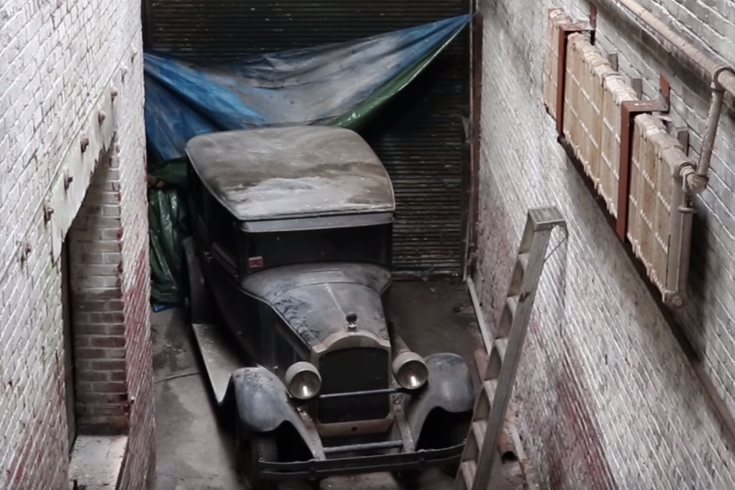 A nearly-century-old Packard Six sedan, which has been sitting in an old Philadelphia factory for decades, is starting a new life. Johnpaul Golaski -- a Philly resident whose father, Walter Golaski, owned Golaski Laboratories, including the factory building in Germantown at the corner of Apsley Street and Wayne Avenue -- and his family are turning the property into a joint venture with Mosaic Development Partners. The property will be turned into a mixed-use development called Golaski Labs, according to Alexandra Golaszewska, who is Johnpaul Golaski's sister. Golaski's father had purchased the property back in the 1970s, and operated Bearing Products Co. out of the buildings. The elder Golaski, who died in 1996, had actually purchased the Packard in the 1940s, and used it to drive between Philadelphia and his parents’ house in Connecticut, according to his son, before the car broke down in the 1950s. Golaski's father moved the car from his sister's house to the factory in the 1970s, where it sat until last month. The folks at IronTrap Garage, a YouTube show (and an actual garage, of course) about antique vehicles that has a solid following online, talked to the younger Golaski and documented the relocation effort by Cabin Fever Auction Company — based in Douglasville, Berks County — last month as the Packard left its resting place of more than 40 years. The old Golaski Laboratories building originally housed the ideas and manufacturing operations of Golaski's father, a Drexel University alumnus who opened Bearing Products Co. and the Overbrook Knitting Corporation. His father began his career developing new kinds of knitting machines, and went on to revolutionize blood vessel replacement. The car itself is in pretty good condition, considering its age, including still-functioning pull-down curtains. Its light switch — yes, its light switch — doesn’t work, but that’s on the restoration agenda. The car’s last inspection, according to the Commonwealth of Pennsylvania Department of Revenue sticker still on the windshield, was in 1955. Its license plate (80NB5) expired on March 31, 1956. If the Golaski family manages to fulfill its goal of getting the car up and running again, those might need some updating.